The Parks and Recreation Commission approved the development of the park on March 12, 2012. The development of Ontario Town Square is part of the City’s vision to revitalize downtown Ontario and transform the area into a model of sustainable living. The park serves as a community gathering/event space and provides the City’s historic downtown and surround neighborhoods with its first dedicated park space. In addition, the park will help support the various programmed events downtown, such as Christmas on Euclid, Fourth of July celebration and car shows, etc. 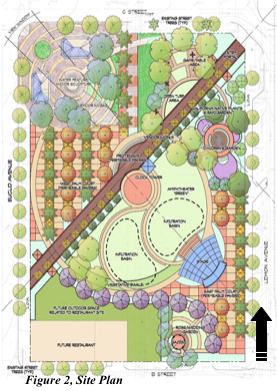 Site Design- The Park is located within one square block of downtown that is bounded by Euclid Avenue to the west, Lemon Avenue to east, C Street to north and B Street on the South. Existing structures on the site include the Historic Bank of Italy on the southwest corner and Wells Fargo Bank on the northwest corner. Ontario Town Square is designed to be a flexible space capable of holding a number of different events and activities throughout the year, while creating a unique retreat for the downtown shopper, worker, and adjacent residences. 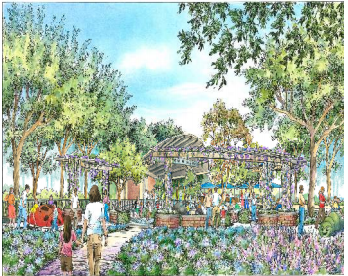 The 1.77 acre park features a “pedestrian promenade,” “open air amphitheater,” “palm court,” “children’s play garden,” and future restaurant patio spaces and related uses. 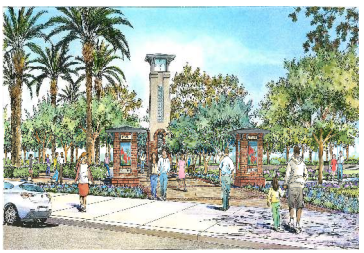 Ontario Town Square is organized on a diagonal view corridor and pedestrian promenade that extends from the southwest corner of the site at Euclid Avenue on an axis to Lemon Avenue at the northeast corner of the park, providing a view window of the Ovitt Family Community Library. The entry into the park promenade, at both the southwest and northeast is flanked on each side by 8 foot high monuments that create an entry portal into the park. The monuments feature a brick veneer exterior with a low pitched hipped comp shingle roof with wood knee brackets below the eves The center areas of the monuments are used for signage and branding of the park. Spaces of different scale and atmosphere are developed along the central promenade, spiraling away from the central clock tower focal point. The clock tower is located at the center of the park and stands at a height of approximately 54 feet. The tower has four functioning clock faces that illuminate in different colors at night. The top of the tower has a low pitched hipped composition shingle roof with decorative knee brackets below the eves. Vertically at the center of each side of the tower is a cast aluminum chevron pattern design detail that is illuminated at night and synchronized to change colors with the clock faces. The base of the tower is designed with a 12 foot high brick veneer base with vertical brick design arch detail that extends up to a height of 18 feet. A decorative cast aluminum gate is at the base to provide access into the tower for maintenance of clock. Along the promenade, adjacent to the north of the tower, is a history wall. The wall is 34 feet in length, with a 20-inch high seat wall on each side. The history wall varies in height from 3 feet at edges to 6 feet at the center. City staff designed a tile mural for each side of the wall that captures the history and community of Ontario (Figure 4, History Wall). To the west of the tower, adjacent to the east of Euclid Avenue, is the Palm Court. This area has been designed to accommodate community events such as a farmers market. The tree-well pattern locations within the court have been designed to allow for shading and adequate space for vender canopies (Figure 5, Palm Court). 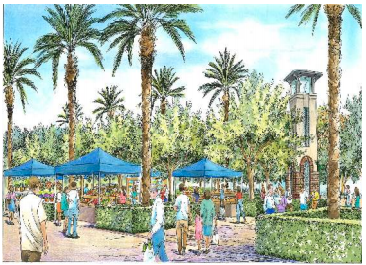 To the north of the Palm Court, where the Wells Fargo Bank exists today, a future plaza is planned for that area. The plaza will provide a northwest view of the San Gabriel Mountains, the historic bandstand on Euclid Avenue and the Granada Theater. This future plaza will contain a water and/or sculpture feature and vendor kiosks for a café or other food/retail uses. To the east of the view corridor plaza is the game and picnic table area. This passive area will be a place where one can relax and enjoy lunch or play a game of chess or checkers. South of the central clock tower is the amphitheater stage area. 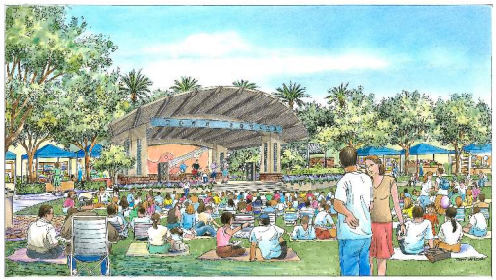 In front of the amphitheater is a lawn area where people can bring beach chairs or blankets to sit on and enjoy live music or an outdoor play. The lawn area gently slopes down towards the stage allowing for unobstructive views of the stage. The amphitheater stage is designed with a curved metal (diamond pattern) shaped roof that slopes down from the front of the stage to the rear allowing sound to project out. Exposed metal rafters, evenly spaced, are along the ceiling of the stage (Figure 6, Amphitheater). The support columns for the roof structure are designed to be consistent with the design of the clock tower. Each column is constructed with smooth plaster exterior finish, a brick veneer base and a cast aluminum vertical chevron pattern deign detail at center of each side of the each column. The brick veneer base treatment is carried around side and rear base of the stage area. In addition, the rear wall of the stage is also used as a place to incorporate historic murals depicting the history of Ontario. To the west of the amphitheater, along the north and east elevations of the Bank of Italy, is lawn area. This area is envisioned to be used as an outdoor dining area for a future restaurant user for the Bank of Italy. To the east of this grass area is a gazebo. The gazebo is also used by the community and/or a future restaurant user to hold weddings or other specials events. The gazebo is designed with steel lattice roof dome, steel support columns with brick veneer bases and a chevron metal detail design along the entire fascia of the dome. A children’s tot lot is to the northeast of amphitheater stage area. This area features a children’s garden and play area. The central focus of the play area is a water fountain. This fountain area features frogs, turtles, ducks, and alligators that intermittently squirt water to entertain children (Figure 7, Tot Lot). Along each side of the walkway, into the fountain area, are low meandering walls that incorporate historic murals of Ontario. In May 2013, the City received State Urban Greening Projects Grant (Proposition 84) in the amount $998,000 for the park. The Urban Greening Program provides funds to assist local jurisdictions in developing a master urban greening plan that will ultimately result in projects to help the State meet its environmental goals and the creation of healthy cities. The grant requires California native species and plant materials to be used. Sustainable elements are integrated into the site’s design, which include drought tolerant and California native landscaping and permeable walking pathways. 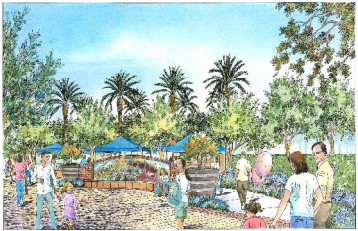 The landscape selections for the park include California native trees and shrubs such as Quercus agrifolia, Coast Live Oak; Umbellularia californica, California Bay Tree; and Platanus racemosa, Western Sycamore. To maintain the historic context of Ontario’s early agriculture and industry, Olive trees (fruitless) and Citrus trees in planters are used. Tree and shrub species appropriate for the site were selected to add color, fragrance and texture within the constraints of the local dry climate. View corridors were maintained to provide the great views of the adjacent San Gabriel Mountains. However, shading is important in the hot inland valley so shade trees were needed that could thrive on natural rainfall or low amounts of supplemental water, such as Chitalpa and Holly Oak. The Palm court area uses a desert species of Date palm – Phoenix dactylifera for vertical accent and light shade. The landscape palette for the park complements the site design and will work well with the program events such as the farmers market, concerts in the park, children’s play area and other community gathering activities. Durable, low maintenance shrubs such as Achillea, Yarrow; Salvia mellifera, Black Sage; and Yankee Point Ceanothus-California Lilac are located in masses for greater impact. Infiltration of storm water will be handled by the expanse of pervious paving stones in the walkways and vegetative bioswale to capture storm water and improve water quality will be integrated into the amphitheater grass lawns area.